Ice hockey in Israel is usually played at small rinks, forcing the national team to have to compete abroad. But this year, at the ice hockey tournaments of the 20th Maccabiah Games, the Israelis will get to compete on a regulation-sized ice rink, installed in the Pais Arena in Jerusalem. The arena in the southwest of the holy city is normally used as the home of the Hapoel Jerusalem basketball team with a capacity for 11,600 spectators and for concerts. With the bigger field of play in ice hockey the organizers expect a capacity for 10,000. That’s a sharp contrast to what players in Israel have been used to since the opening of the first ice rink in 1986. The Maccabiah Games, sometimes described as the “Jewish Olympics”, are a multi-sport event held every four years in Israel with Jewish athletes representing the different countries they come from, dating back to 1932. 10,000 athletes from 80 countries in 47 sports are expected to compete this month in Israel. Ice hockey was played twice before, in 1997 and at the most recent edition in 2013 in Metulla. Despite being in a warm country with a large area covered by desert and the thermometer expected to hit 37°C in Jerusalem today, ice hockey is not totally unknown in Israel but still rather exotic for the average Israeli. 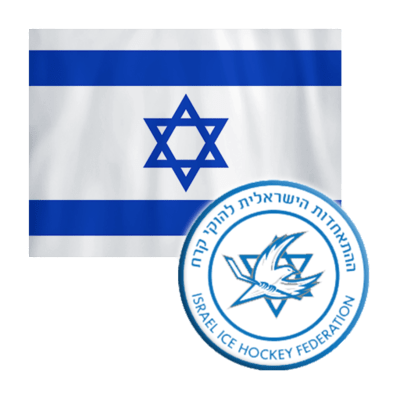 “We have approximately 800 ice hockey players and four leagues,” says Lihu Ichilov, the General Secretary of the Ice Hockey Federation of Israel, who has been involved in the sport for 27 years, basically since its beginning in Israel. Ten teams play in the men’s A league, 14 in the B league, 10 in the U20 league and 15 in the U18 league. While there’s no women’s hockey competition, 28 female players compete in boys’ leagues and can be two years over the boys’ age limit. While the rink in Metulla, a city in the north partly surrounded by Lebanon, is full size, the one in Holon, a city of 190,000 inhabitants a few kilometres away from Tel Aviv, is about half the size, 900 square metres, and opened in 2013. And there is an even smaller one in Ma’alot. “Hopefully in two years we will have an Olympic-size rink attached to the current rink in Holon. The owner is working on it and the plans have been submitted to the municipality. This will sort out all our problems and increase the development to unbelievable stages,” Ichilov says. It would not only be full size but also have a capacity for at least 5,000 spectators according to him. Israel has less experience playing at home than other countries competing at Division II level. In 1996 Israel played a qualification game for the 1998 Olympics in Metulla. They lost 10-2 to Greece but that game was eventually declared a 5-0 victory for Israel because Greece used ineligible players. Israel advanced but lost in the following round. In 2006 the IIHF Ice Hockey U18 World Championship Division III was planned in Metulla but was eventually moved to Romania due to security concerns caused by tensions at the Israeli-Lebanese border that eventually led to a war later that year and the evacuation of the population. Having played at many international-size arenas abroad, culminating with a Division I participation in 2006 in Amiens, France, the Israelis can now get the experience of a top-notch arena at home with the rink installed in Jerusalem. Similar to the IIHF at Olympic tournaments, the Ice Hockey Federation of Israel is setting up the competitions at the Maccabiah Games with the arrangements for the teams, paperwork, schedules and officials. The games are played in a city that has never seen ice hockey before, although there is a team with players originally coming from inline hockey that was founded in Jerusalem but plays at the other rinks and even made its way up to the Senior A league two years ago. The North American Maccabiah teams were pushing to have the event in Jerusalem rather than in the remote north. This eventually led to discussions with the mayor of Jerusalem and IHFI President Evgeni Gusev to make the dream come true. “The rink was bought from an Austrian company. It’s just a shame that it will finish in a warehouse waiting to be requested again. But I have the feeling they will build it up every year in summer,” says Ichilov. Three ice hockey tournaments will take place at the Maccabiah Games that are played from 4 to 18 July – except on Saturdays, or Sabbath, when the Jewish part of Jerusalem seems to come to a standstill. The men’s teams play in the Open Tournament that includes Canada, Germany, Israel, Russia and the Unites States. The Masters Tournament for players over 40 includes Canada, Israel, Ukraine and the United States. And the U18 tournament is played with teams from Canada, Israel and the United States. The Canadian Jews have been most successful at the last edition with famous coaches behind the bench: Guy Carbonneau at the men’s team and Jacques Demers in the over-40 category. Israel will play with its regular players from IIHF events in the Maccabiah Games although not all of them will be able to come. “This will give a chance to younger players,” Ichilov said. “But it’s a minimum AAA and college players who come for Canada and the U.S. We don’t have any thoughts about them, we will fight, but it will be very difficult to compete with them. Our players are either students, in the army or working for their living,” he says. The national team has had its ups and downs in the IIHF Ice Hockey World Championship program. Peaking at the 28th-place finish in 2006, it went down to 41st in 2011. Currently Israel is 35th in the 2017 IIHF Men’s World Ranking. “During the last three years the national team has gone from strength to strength,” he says and explains the history of hockey in Israel that has started by immigrants from North America and the Soviet Union. The many players born outside of Israel also made it difficult for them to become eligible to represent Israel internationally. Today Ichilov thinks that maybe a quarter of the 800 players was born outside of Israel. “What we see now is a second generation to those who started hockey in Israel. In the Maccabiah Games we will see a few fathers in the veteran tournament whose kids are playing on the U20 or U18 national team,” he adds. While most players from the recent Israeli men’s national team joined from local clubs, some try their luck abroad. Eliezer Sherbatov is probably the most famous of them. Born in Israel and playing in Metulla, the forward born to Russian Jews went to North America and made it to the top level in Canadian junior hockey playing in the QMJHL. He then became a professional player in France and Kazakhstan. One issue that has made development different was serving three years in the army. With the creation of the U20 team, an age group that used to have a lack in players due to the military service, the federation now aims at better conditions with delayed service or an athlete status at the army. Roey Aharonovich and Yuval Rosenthal are two players who got the permission to delay the military service because they count as elite sports athlete under contract abroad. After leaving his hometown team Rishon, Aharonovich played junior hockey in the United States and will start college hockey at NCAA Division III level at the Neumann University. Rosenthal played junior hockey in Canada and is now with the Colorado State University. The federation hopes that Ariel Kapulkin will also be granted a delay after having played junior hockey in the U.S.
“This is the reason that we have started two years ago to build up the U20 national team. The team consists of players who are due to go to the army. Once they finish high school, they have to go three years to the army. For those on the U20 national team we apply to be an active athlete in the army. Then they are given 90 days a year to go to camps and championships,” Ichilov explains. Trying to combine the army and hockey is one aspect to improve the development of players, the other is grassroots hockey. The experience of organizing an international event at a big arena is one that Ichilov hopes to translate to IIHF hockey as well. The Ice Hockey Federation of Israel applied to host the 2018 IIHF Ice Hockey World Championship Division II Group B in the same arena in Jerusalem but uncertainty about the dates and availability didn’t help in the vote. The tournament was eventually awarded to Spain. “We have the support from the government to hold an IIHF event but we didn’t have the rink for that time. It’s difficult because it’s the biggest arena for basketball and the season doesn’t end before May. So it would have been impossible to get it earlier. But hopefully we can hold an IIHF event in Holon when we have the new rink in two years,” he says. But first it’s time for Maccabiah ice hockey at the cool arena during the summer heat in Jerusalem. The men’s final on 15th July, which Ichilov predicts to be a Canada vs. USA game again, will be broadcast live on Israeli TV channel Sport5. Once the tournament is over, the arena is set to stay for public skating and ice shows before it will be dismantled.